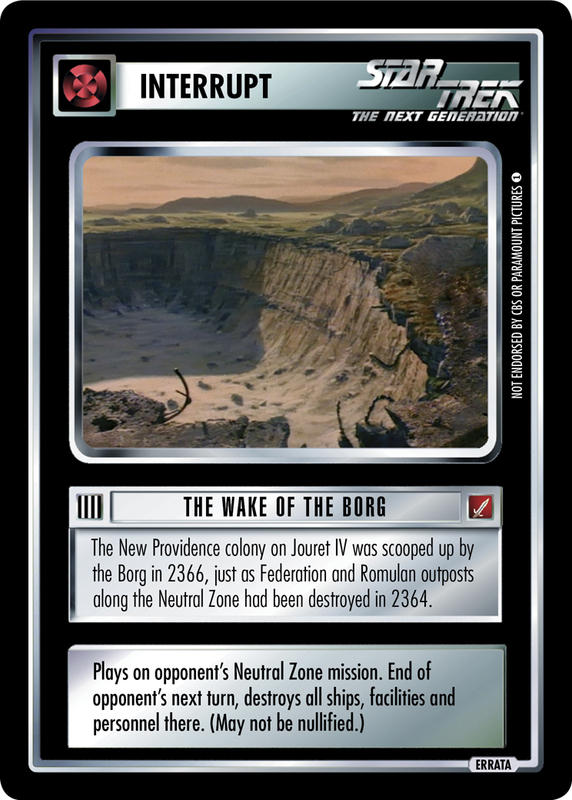 The New Providence colony on Jouret IV was scooped up by the Borg in 2366, just as Federation and Romulan outposts along the Neutral Zone had been destroyed in 2364. After the errata for Colony this card was also changed. 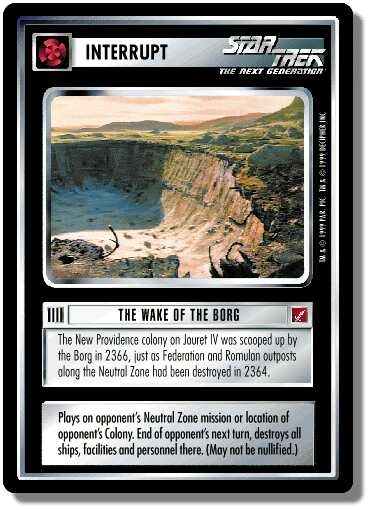 Game text before errata: "Plays on opponent's Neutral Zone mission or location of opponent's Colony. End of opponent's next turn, destroys all ships, facilities and personnel there. (May not be nullified.)" Taken form Current Rulings 2018-07-02. This interrupt does not destroy landed, cloaked, or phased ships. See landed ships, cloaking and phasing. There are 17 entries for The Wake of the Borg (ST1E 7 U 43) at the Tradeplace (29 haves and 7 wants). Click here to see all trade list entries for this Uncommon card! Also see here for all trade lists with any card fom "Blaze of Glory".